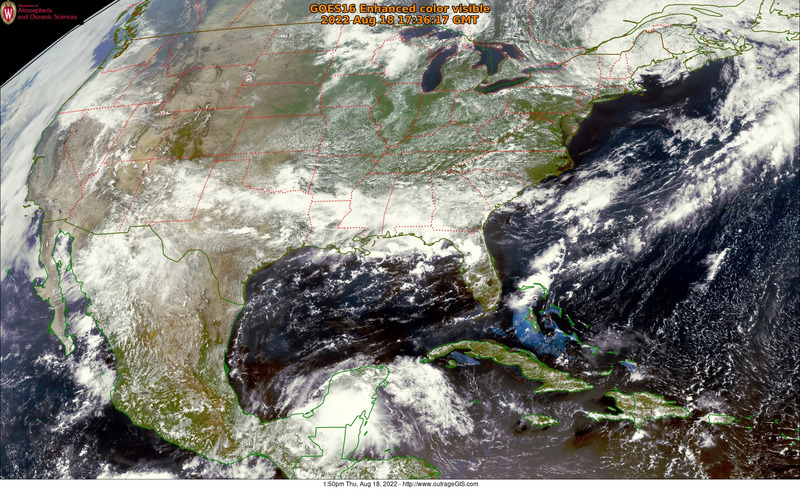 Though GOES-16 is not officially operational, the availability of imagery has steadily increased. We found the Department of Atmospheric and Oceanic Sciences at the University of Wisconsin-Madison hosts a set of imagery. The satellite will become fully online in November and undoubtedly many other data sources will be available. This weather satellite captures 16 spectral bands with time resolutions as quick as every 30 seconds. The spatial resolution (the size of each pixel) is between 0.5 km and 2 km and the visible grayscale image for the continental US is 12,000 x 9,000 pixels and is collected every 5 minutes. We wrote a series of crontab jobs to automate the processing of weather imagery to display on our website.